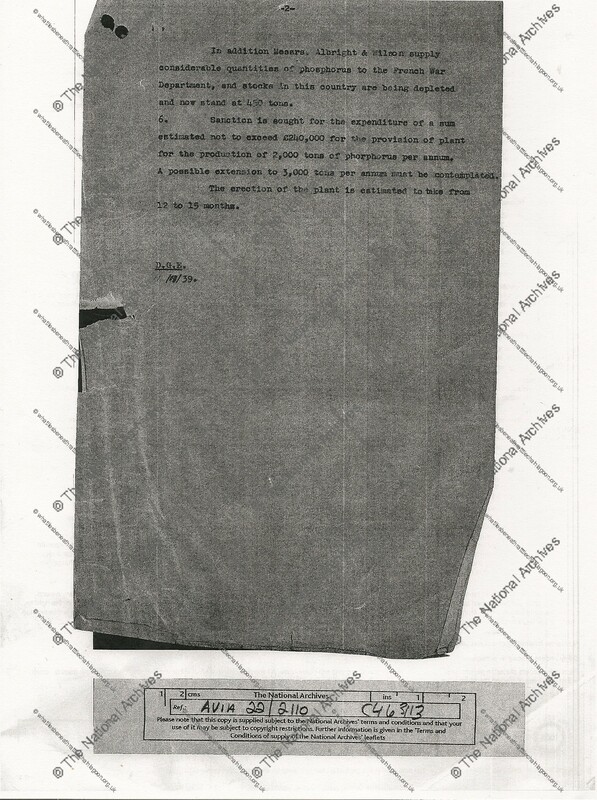 In 1939 with the outbreak of war imminent, The Ministry of Supply (MoS) was formed to co-ordinate the supply of equipment to all three British armed forces. There was, however, a separate ministry responsible for aircraft production (The Ministry of Aircraft production) and the Admiralty retained responsibilities for supplying the Royal Navy. 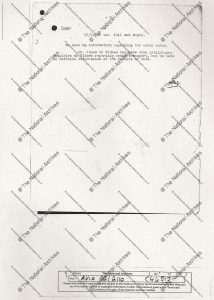 During the war-years the MoS was based at Shell Mex House in The Strand, London. The Ministry of Supply was responsible for building and running the Royal Ordnance Factories which produced explosives and propellants; filled ammunition; and constructed guns and rifles. However, the Ministry of Works and/or private building contractors acted as agents during their construction. The Ministry of Supply also arranged for the construction of a large number of Agency Factories which were run on its behalf by private companies, Albright and Wilson being one of them. These were similar to the Royal Ordnance Factories, but were not part of the Royal Ordnance Factory organisation. Originally labelled HM Factory Oldbury but quickly changed to “MoS Factory Oldbury” did not transfer to part of the post war set of the organisation. In 1946 the Ministry of Aircraft Production was abolished and the MoS took over its responsibilities for aircraft. The Ministry of Supply was abolished in 1959 and its responsibilities were devolved to three single-service ministries. Later, these ministries were to merge to form the Ministry of Defence. Following World War II the post-war Ministry of Supply was created on 1 April 1946 as a result of the amalgamation of the former Ministry of Supply and the Ministry of Aircraft Production. The functions and responsibilities of the new department remained basically the same as its predecessors. 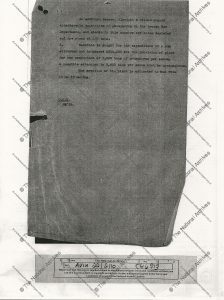 The Ministry of Supply was wound up in 1959 when the Ministry of Aviation was created, and other functions in respect of the British Army and the Royal Air Force supply reverted to the War Office and Air Ministry respectively. The winds of War in 1939 increased demand for phosphorus. 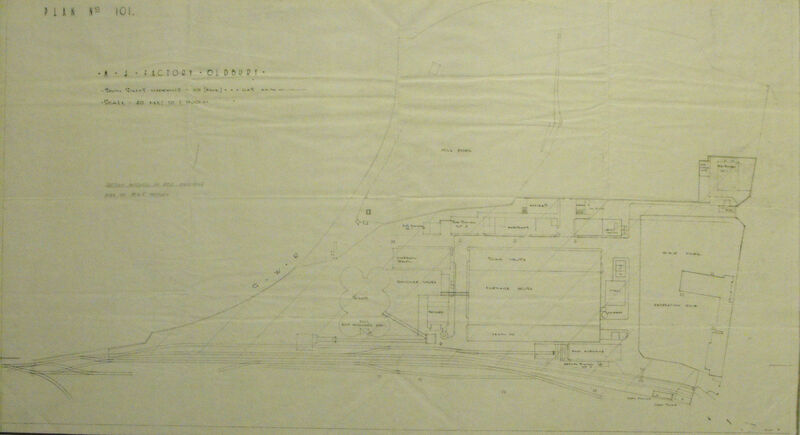 The National Archives at Kew offer some insights into the Oldbury factory activities. This agreement also gave AW preferential rights to undertake any work for this type of activity so long as the company could provide the capacity and undertake the work punctually. 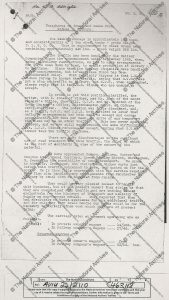 The following National Archives document confirms the situation in September 1939 with the outbreak of war. It confirms that Albright and Wilson were already supplying The French War department with phosphorus, that they were the sole producers in the UK, and that at this time stocks were considerably lower than required for a range of tasks. 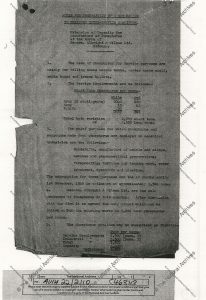 The war cabinet supply and production sixth monthly report by the minister of supply covering the month of January, 1940 covers multiple aspects of preparations for invasion. With the Ministry of Supply taking over an adjoining farm to the Trinity Street works. Six furnaces were eventually put into operation, originally billed for just four, and the Oldbury works were soon producing phosphorus for filling purposes under contract no 294/5585 (con .2). 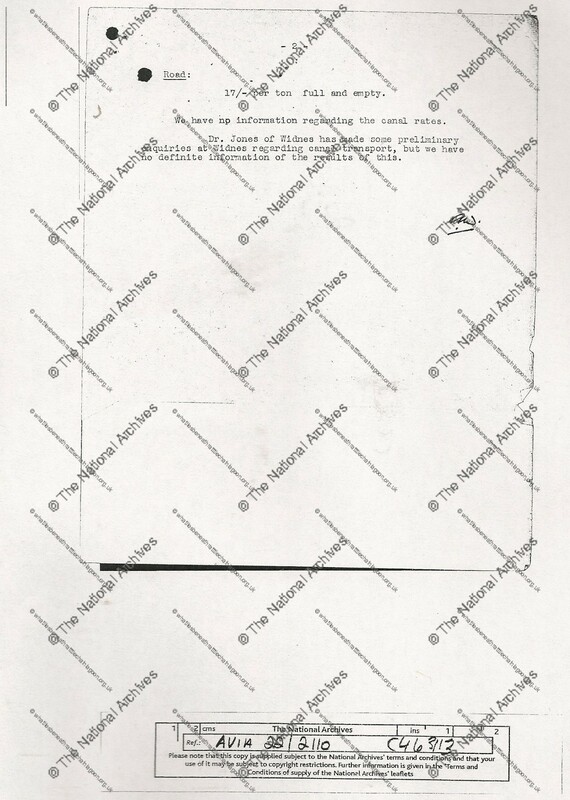 A great deal of information about the setting up, running and technical considerations concerning the Albright and Wilson operation are contained in the National Archives, and we have read through them all. 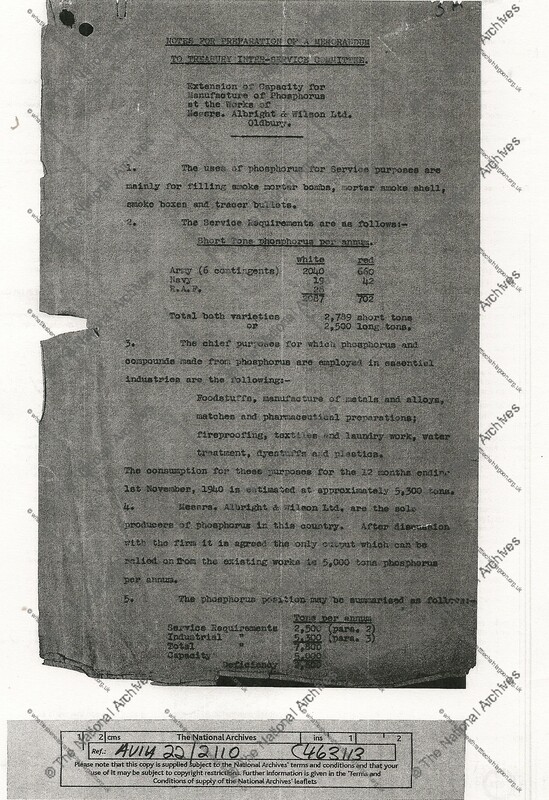 A letter from W.B Albright, Arthur’s grandson, to T.A Smith of The Ministry Of Supply (D.X.2) Directorate of explosives dated 2nd January 1941 reveals that the first furnace started operation on new years day at 5am with the second 5 hours later. 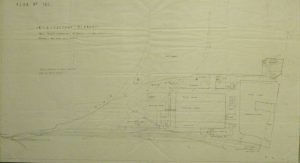 Albright and Wilson were also producing phosphorus under contract at their Widnes factory, with raw materials being transported between the two. 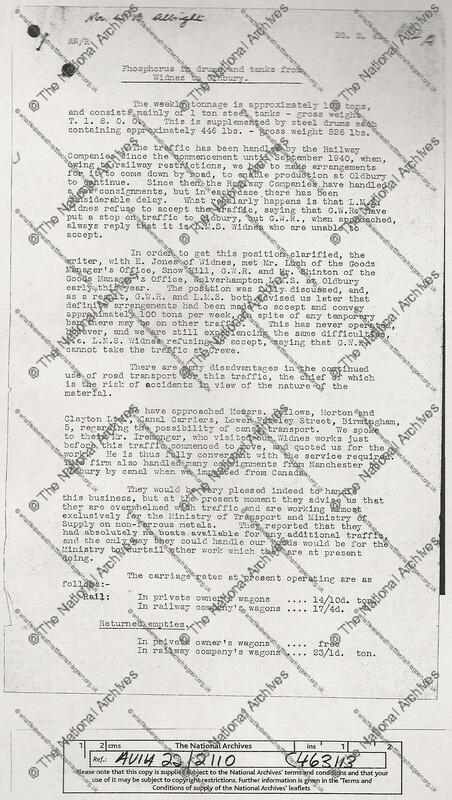 The rail links between the two sites became increasingly important, as this letter confirms. This carriage of toxic materials as well as the increased production by people who were unused to working in such conditions woud have been extremely hazardous. It would also we argue have led to corners being cut to produce what the Government wanted. Environmental costs, and toxic legacies were not thought of then, and certainly not concerned with when too many were celebrating victory afterwards. As we have already stated, and will do so throughout this website, Albright and Wilson’s links to the British military and Government are inextricable and we make no secret of uncovering stones which some would like to be left unturned. This includes the inconvenient truth concerning white phosphorus production at Trinity Street and its dumping at Rattlechain lagoon. The Health Protection Agency were remiss in making no mention of this period of chemical production in their Human health risk assessment study of the lagoon, and so we will explore the issue they conveniently decided to omit for the client Rhodia, who also now strangely want to distance themselves from this important part of what was a very, very profitable war for their former “peace loving “ Quaker company at the direct funding of the British Government.